Bitrix24’s CRM manages email correspondence with contacts, companies and leads and can receive and append incoming email to the appropriate CRM object or record. Sending emails from the CRM can be done individually or in bulk, files can be attached to messages, and pre-made templates can be implemented. 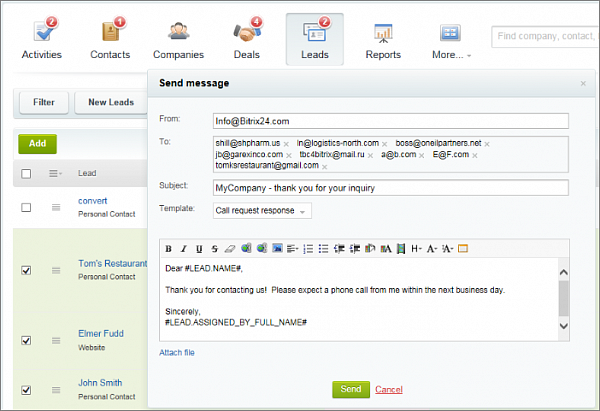 Such correspondence is saved as an event in the given CRM element, whether it is a lead, company, or contact. No additional settings need to be configured for this system of interaction with contacts to operate – as long as the email addresses of both the contact and the sales manager are correct, all email will be sent by Bitrix24. Bitrix24 also allows receiving and saving of incoming emails – using our Send&Save email integration technology. For example, a sales manager sends an email to a lead from the CRM, then the lead replies to the email. This reply will be appended to the lead record in the CRM. Thus, all email correspondence with leads and contacts can be kept in the CRM and reviewed at any time by a user with appropriate access permissions. To implement this mode of email handling, you should assign an email address to your CRM, for example, CRMsales@your_company.com, for reception of email. 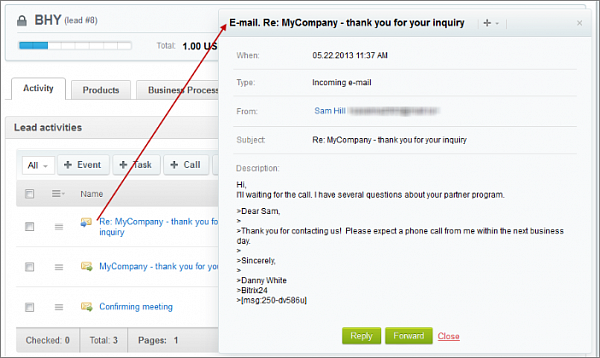 When a sales manager sends and email from the CRM, a special code is attached to the message (either in the body or in the subject – depending on the setting), and the ‘reply-to’ field is filled with the email of the CRM. When the lead or client responds to the message, the email goes to the sales manager and is sent to the CRM’s inbox. 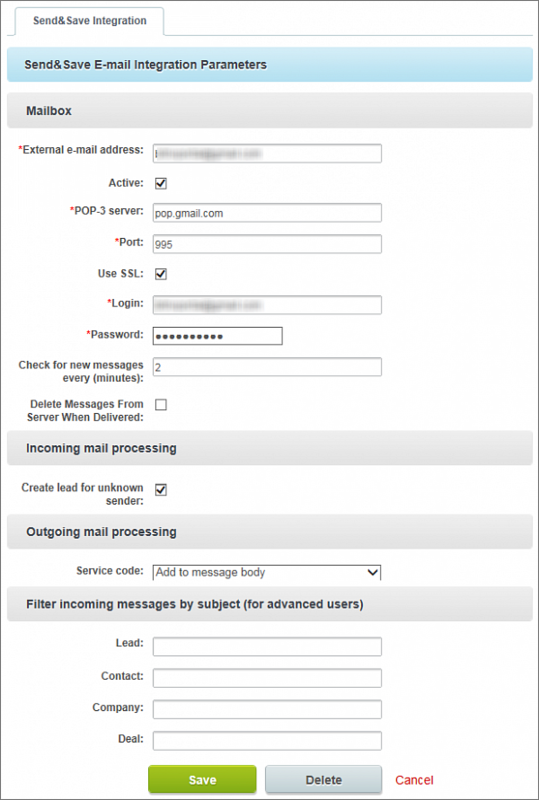 The CRM collects the messages in this inbox periodically and uses the code to determine to which record the email should be appended. The location for setting up an email address for the CRM is found at CRM>Settings>Send&Save Integration in your Bitrix24 portal. Delete messages from server when delivered – this option deletes the messages in the CRM’s inbox after they have been processed. We do not recommend this option if the inbox is used for messages other than the CRM, since all messages are deleted, whether intended for the CRM or not. In the “Filter incoming messages by subject…” block, advanced users can set your own rules concerning the proper formulation of service codes. P.S. 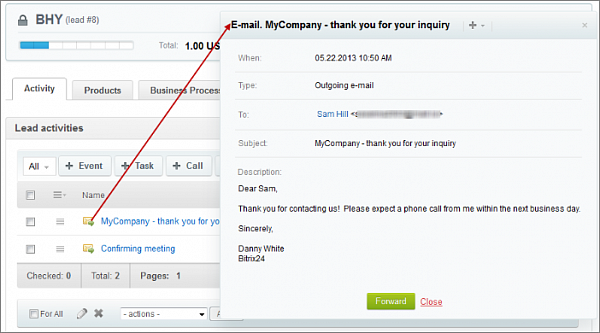 You can now use multiple email addresses in a single Bitrix24 account. Please read our new blog post about new email integration options for Bitrix24 CRM.